Green Giant coupons are great because they give us the rare opportunity to save on vegetables. Vegetable coupons are somewhat of a holy grail for couponers. Coupons often get a "bad rap" because they are "only for unhealthy items". Well, I disagree with that statement, but that being said, it's always nice to be able to save on some vegetables too. Green Giant coupons are no longer only for canned or boxed vegetables though. Green Giant has recently released some Green Giant vegetable chips and they are pushing them hard, with lots of available coupons. Right now, we can find Green Giant coupons in the newspaper inserts often, in addition to being available online for printing. At the time of writing this post, there are currently 3 different inserts with Green Giant coupons in addition to 4 different websites where you can print Green Giant manufacturer coupons. I will say though, that all of the Green Giant coupons that are currently out are for their new veggie chips. 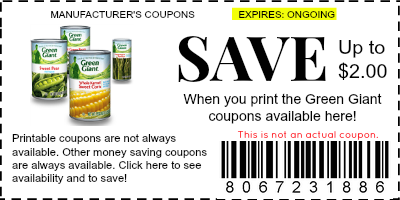 When not found online, Green Giant coupons will typically come in a Smart Source newspaper insert that is heavy with other General Mills coupons. These coupons come about once per month. 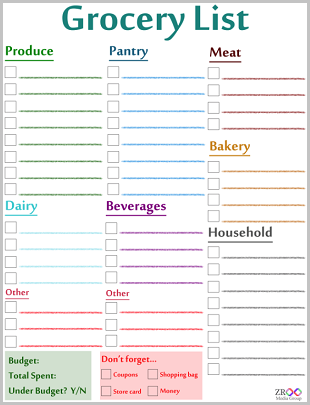 The printable online coupons are generally released, or reset on the first of every month. Keep an eye out for Green Giant at your local dollar store. Some of the best deals to come from green Giant coupons have come from dollar stores. Whatever you do, make sure you print Green Giant vegetable coupons right when you see them online, because they tend to not last very long. Coming back here at the 1st of every month is a good way to find them. Additionally, you can follow this site using the social media buttons at the top of the site for more up-to-date info on whether Green Giant coupons are available or not. Slim Fast coupons come to us in a variety of different ways. 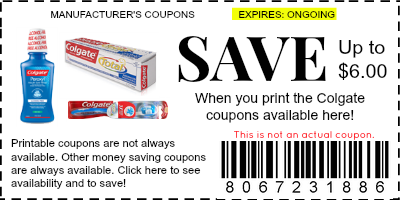 You can print Slim Fast coupons online, in addition to finding them in coupon inserts in the Sunday paper and on products in the form of peelies. The main thing you have to look for when seeking out Slim Fast coupons is the difference between a coupon for Slim Fast shakes and drinks and coupons for Slim Fast bars. The coupons are generally specific to those products, so if you can use one on drinks, you usually cannot use that coupon on bars. Target commonly has store specific Slim Fast coupons which you can start with Slim Fast manufacturer coupons to double up on your savings. Target also puts Slim Fast items on their gift card promotion deals often - offering a $5 Target gift card back when you purchase a certain number of Slim Fast products. Use a store coupon, a manufacturer coupon and get this gift card deal to triple up on your savings. We cal that a perfect storm in the couponing world and it doesn't come around very often. When it does, it's glorious and time to stock up! Keep an eye on expiration dates when stocking up of food products like Slim Fast. The worst thing is to buy a bunch of a product and to soon realize that they are all near or past expiration date! 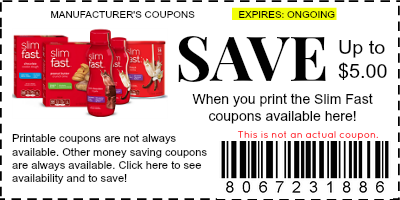 Because of the potential for the perfect store of coupon savings, I recommend that you print Slim Fast coupons whenever they are available and just have them on hand in case one of these magic deal combinations comes up. Its a real bummer when these types of deals come up and you have to pass it up because you don't have the printable that is no longer available to print. Do you find Slim Fast coupons in other places? Tell me where! 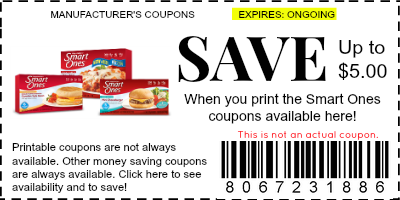 Smart Ones coupons are some of the more frustrating ones that I have seen online. They seem to always want you to buy 10 or 12 of the product. That being said, the savings can be as much as $4 form one coupon! There are also many different types of Smart Ones coupons, due to the many different products that Smart Ones makes. They have coupons for all frozen items, breakfast items, oatmeal items, Smart Creation items and more! For that reason, be sure to pay attention to the wording on the coupons to make sure you are printing and redeeming the correct coupons. When the Smart Ones coupons are in the Sunday newspaper inserts, they are generally found in the Red Plum insert. 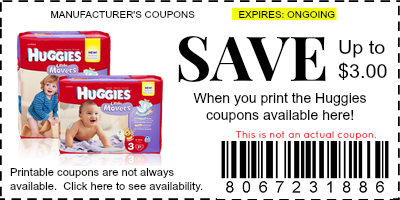 Most likely, if they have a newer line of products out, the coupons in the paper will be for those items in particular. There is also a few Smart Ones coupons on the Smart Ones Eat Your Best website. Smart Ones products can be found at pretty much all major grocery stores and even Walmart and Target. The nice thing about that is that occasionally, Target will release a store coupon for Smart Ones products. You are allowed to use both the manufacturer coupon and the store coupon on the item, thus creating an even bigger savings opportunity for you! If you ever see Smart Ones coupons for less than 4 items, I recommend printing them. A I write this post, there are coupon offers for $4 off 12 products and $5 off 15 products. To me, that is a LOT of Smart Ones to purchase at one time. The $5 savings is nice, but I don't have the freezer space for 15 of those! I'd rather have a $1/2 or even $1/3. Have you found Smart Ones coupons anywhere else? Do they make tearpads or peelies for Smart Ones products? Let me know if you've found them elsewhere!